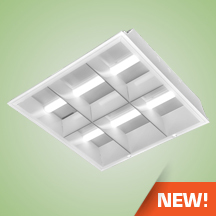 This fixture is designed for recessed ceiling mounting application. Perfect for commercial office spaces, schools, hospitals or retail merchandising areas. With 50,000 hours of life at L70 standard and a 5-year limited warranty the fixture maintenance cost is reduced substantially over time. Housing constructed of structurally embossed, 22 gauge cold rolled steel. lite housing for easy installation, post painted body with smooth sides for safe handling. Extra reinforcement in body to create additional rigidity. Superior mechanical light seal to eliminate the need for foam gasketing. Standard steel door frame has superior structural integrity with a premium appearance precision cut corners. Integral T – Bar clips to secure fixture to T – Bar system. Post painted housing and components with a Lighting White Polyester type paint which has a UV stabilizer included with a 93% reflectivity. Raw steel goes through our custom wash system with a mild solvent and pre treatment “rust inhibitor” before passing through a preheat oven. After the paint is applied the fixture then passes through the cure oven for maximum adhesion. Each fixture is painted to a minimum of 2-3 mil thickness for extra durability. LED channels provided with frosted lens for a smooth softer light dispersion. semi-specular aluminum louvers utilize the latest developments in louver finishing. Cam action latches and die formed T-hinges for door insertion from either side. Nominal 2 5/8” deep louver for excellent cut off and glare control. Long life LED’s and high efficiency drivers work together to provide superior performance in an efficient package to deliver optimal performance. LED’s available in 3500K, 4000K and 5000K with a CRI >82. Electronic drivers are available in 120/277 volt applications. 0-10V dimming as well as 50% step dimming capabilities available upon request. When in the step dimming 50% position the 0-10V leads may still be utilized for further dimming control. ETL listed. LM79 and LM80 tested.